Seville is located in Andalucia. Influenced by the history of different faiths and cultures you will find dishes and food with an incredible mix of Spanish, North African and Islamic influences. In saying that, the streets are full of very traditional restaurants some of which have been serving the same dishes for more than a century. Only recently there has been a shift in the food scene. 5 years ago, when I lived there many restaurants that you would walk into would have more or less the same menu serving similar plates of food. It was easy to compare who made the best tortilla, who served the best whisky sauce and who had the crunchiest fried eggplant. There were only a few restaurants serving more contemporary plates of food. This gave me a really good and clear understanding of the food profile in Seville, there was no confusion, that was the food of Seville. Now more recently there has been a a shift in the food culture. There has been a number of new restaurants opening up with influences from other larger cities around Spain and the world. This has created an interesting food scene, where traditional dishes or flavours are being used but in a more creative way, pushing the boundaries yet still maintaining a strong core connection with Andalusian dishes. When I think about which ingredients reflect the city, I think about: almonds, sherry, pork (solomillo), coquinas (very small clams), octopus, olive oil and eggplant, and of course jamon. Seville is so close to Extremadura where you can find black pig farms. Coquinas and Cerveza…I can never get enough of these. The coquinas come from the coast off Huelva and with the seafood market open every Tuesday you will find all restaurants serving a plate of these. These are my favourite restaurants, bars and places to go for food in Seville. I’m always interested in trying new places that I’ve never stepped into before but I have to say I always go back to my favourites. I’ve also included another shorter list below of good places I’ve tried in the past but haven’t been able to document. My number 1 go to place in all of Seville! These guys know how to cook flavour packed Andalusian and Spanish dishes. We come here literally every time we are in Seville, a few times a visit! They serve ice cold Sangria and flavoursome dishes inspired by Seville and other parts of Andalucia. One of their restaurant has a seafood bar (Azotea Gran Poder) with the freshest produce and their chefs are also happy to cook up a dish that will surprise you. From the menu try their octopus with potatoes, olive oil and paprika, as well as their other seafood dishes likes coquinas and prawns. The homemade croquettes are crunchy with a fresh warm filling and the cold almond soup is also one to order, providing a refreshing and palate cleansing dish, ideal in the hot summer months. They have four restaurants scattered around different suburbs of the city so I’ve included their website for all their contact information. Right in heard of the centre, Mamarracha prepares tapas that are contemporary and rustic at the same time. Try the smoked eggplant pate, the padron peppers with chipotle mayonaisse, the french fries with melted cheese, spring onion and bacon, the black pudding/morcilla with organic rosemary honey, the mamarracha burger and the tuna tataki. Their food is cooked on a flame grill so their meat is also really delicious and succulent! Translated as the black sheep tapas bar, we finally tried this place on our most recent trip to Seville. It’s one of the sister restaurants of Mamarracha so it has a couple of similar inspired dishes (the burger and they also serve a tuna tataki – however with different flavours complementing the tuna). I really liked it and think that it’s nice for a lunch. It gets really busy though so either come early or come later! We had the tuna and marinated capsicum rosemary tostadas, their burger and the tartare. We also had to try the slow cooked pork cheek with potato mash…I think that is the best braised pork dish that I’ve ever had in Seville. It was SO tender, SO soft and very rich. I can’t wait to come back here next time we are in Seville and try the other dishes on their menu! I still remember my first experience at this place. A local brought me here. I didn’t understand why we were waiting 1 hour to get a seat at this restaurant. Then I tried their chicken with almond sauce, the crispy eggplant that is fried in olive oil and drizzled with honey and the pork that comes with a whisky sauce. My housemates, friends and myself became pretty obsessed with this place, coming here on a weekly basis. I then discovered their second restaurant literally was located 2 streets away from my apartment and then I would come here a couple of times a week. This is the kind of restaurant that you rock up to and enjoy a couple of glasses of vino or cerveza at the bar and wait to be seated. Once you’re at the table you try to limit yourself to just a few dishes but the menu looks so good that you order half of it! In a beautiful street opposite a cathedral and next to a courtyard with orange trees…you can find Il Riconcillio. Still standing and very alive, this place is the oldest tapas bar and restaurant in Seville and apparently Spain. Opened in 1670 they have kept their traditional ways serving Andalusian and Mozarabic dishes! Writing your order down right in front of you on the wooden bar. You can also find a seat at the back of the restaurant but come early for a table. I think it’s a great place to have a couple of tapas and a drink starting the night. Try tapas like the spinach and chickpeas, cod with tomato, homemade croquettes, mixed fried fish, their tortillas, and chorizo. The oldest markets in Seville and located in one of my favourite parts of town! Here you can find everything from local vegetable and fruit farmers selling their produce, to deli stalls selling freshly created chorizo and morcilla, meat AND incredibly fresh Seafood! They have recently opened a seafood bar too which is popular for weekend lunches. If you are staying in an apartment in the city and have a kitchen, then this is a great place to buy your ingredients! If you would like something a little bit different, this is a really interesting place to come! Especially with a group of friends. The interior set up is really outstanding and it’s worth dining there just for that! Filled with long dining tables and green plants the space is amazing. The food is a blend of Spanish, North African and Pakistani cuisine. We had dishes like the filo pastry cigars, the pita with homemade potato chips and the chicken tikka. The salmon burger is a miss though. Check out my Seville Food Guide video to see the interior! I couldn’t find their website, but they are on Tripadvisor and Facebook. I’ve just included their address below. I absolutely love places like this. So rustic, casual, and so very Andalusian! They have a board filled with mini toasted sandwiches, with typical Andalusian flavours. Try the morcilla toasted sandwich, the jamon and manchego toasted sandwich and their cold salads of the day. This place reflects simplicity at its best! Great for a quick pop in whilst walking around the centre, it’s very close to the Cathedral of Seville so just walk on over! Blues Bar has a special place in my heart. After weeks of moving into an apartment around the corner, I was convinced to come check this place out AND I was hooked. Not only was it where I met the love of my life, but it was then where I spent every single night at. It was like part of our night routine. Even when we were sick in bed, my housemates and I would crawl over to this place, have a shot of something strong and go to bed! It looks like a hole in the wall but this place gets packed at night! 10pm is really early, but you could come here and have a chat with the bartenders like Ramiro or Tony the owner. Come 12pm you can barely move around. I would highly recommend having drinks here one night, in particular a jug of of something…see the bar menu below! A really nice boutique hotel right in centre of the city. I’m recommending this place for the bar upstairs that has a stunning view over the Cathedral. It’s perfect to watch the sun set over the Cathedral (which is literally right next to it) and then light up during the night and enjoy a glass of wine or one of the cocktails, the strawberry daiquiri is delicious. As mentioned in my recent blog on living in Seville THIS place was right in front of my apartment. So of course we ate here SO many times! It’s a place that serves simple and rustic Sevillano food. You can find fried cheese with jam, tapas like olives, pork with whisky, blue cheese or sherry sauce and more! It gets packed on weekends so make sure you come early. 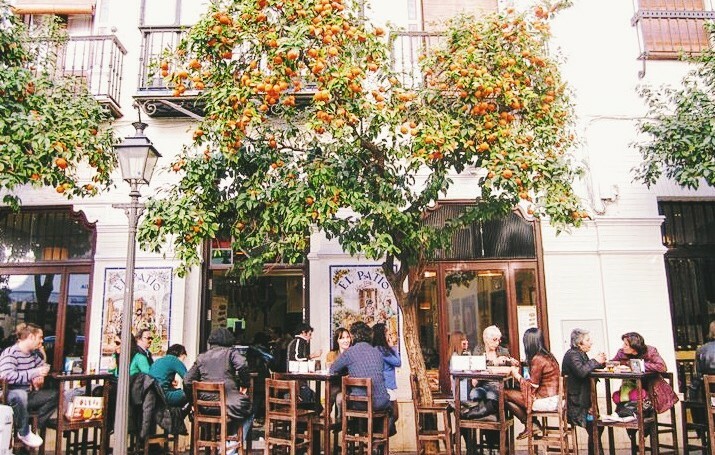 Besides all the nightlife that you will find in and around Plaza Alfalfa, there is also this really intimate tapas bar serving basic yet satisfying tapas. If you’re in the mood for wine and plates of jamon, plates of manchego and some house specials then this is your go to place. Or include it as one of the stops for a tapas bar crawl! This place just opened up in 2014 and I visited it the last two times because it really is a delicious food hub offering locals and travellers a central go to place to find all Spanish, Andalusian and some International food stalls. It’s really good just to get a good idea of what Spanish food is. I would recommend trying the empanadas bar, the fresh seafood bar, the octopus bar, the chorizo bar and of course the cerveza bar! The salmorejo bar also offers a platter full of mini cold soups which are great to share if you are with a group of friends. See more of this place on my Seville Food Guide Video Part 2. This is a must! If you love jamon, this is the best jamon deli in town that you can find that offers various brands, cuts, shapes and sizes of jamon! They sell the infamous Cinco Jotas Jamon (which we visited during our last trip…video coming soon for that!). So if you would love to indulge in some local delicacy then this store is central and easy to get to. Last year we were walking through one of our favourite streets and came upon this new gem! The decor was so stunning inside that we booked a table for that evening! The inside has been renovated and refurbished, originally a gorgeous Sevillana villa. They have really styled the place well. And the food is so good! Definitely try the razor clams! The chefs were so nice they even invited me into their kitchen and taught me how prepare one of the dishes! Hope you have enjoyed and found this guide useful! Leave a comment below if you have any questions.